Despite the miles between the Puget Sound and Knoxville, Tennessee, yesterday's church shooting hits close to home. 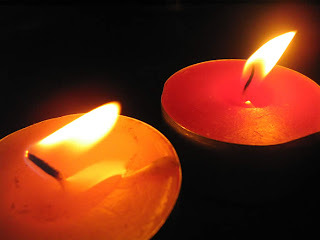 For they, the murdered two, the wounded seven and the remaining traumatized congregants at Tennessee Valley Unitarian Universalist Church in Knoxville, TN, are my brave brethren in matters of faith, tolerance and values. And yet, so too, is Jim Adkisson the shooter, my kin. I pray for him, as well, in this, his darkest hour. If I am to be perfectly honest in these quiet moments of the aftermath, I must then confess my own sins: the hate and fear that eats at him against liberals like us UUs also oft lives in me in no small degree when I am faced with tunnel vision, conservative religiosity; and manifests itself in bewilderment and anger when I see headlines like this. As much as love is the doctrine of our church, the quest for truth our sacrament, and service our prayer, I don't always feel peace and harmony when we dwell together. I look around and marvel at our diversity - I love to see the gays and lesbians with their arms draped around one another - how many church homes afford a safe environ within which they might do so? And I love to see evidence of mult-faith leanings in the room - such as hijabs and kippahs and bright red forehead tikka bindis - as well as the plurality of ethnicities present in the sanctuary. But I also notice those forever absent ~ the ultra-conservative fundamentalists of every ilk within our communities who are considerably less tolerant and not nearly as socially just. I won't just pick on Christians here - for there are countless millions in this nation and on this planet who wouldn't be caught dead in a UU Church, except perhaps on a suicide mission, as Mr. Adkisson set out to undertake yesterday. That's alarming to me. And yet who am I to cast stones? I could no more in good conscience sit and worship at Westboro Baptist Church in Topeka, Kansas or amongst the FLDS and any others who yearn for Zion than my father-in-law, an endtime Christian, might pretend to feel harmonious and at peace hanging out in fellowship at my UU church on any given Sunday. It would be a huge form of torture for him and when I set my worldview aside in order to appreciate his, I get that. This is the great and grievous divide of religion, and I feel it acutely, if only because I often think at times such as this, that church as a construct propagates divisive politics and tribalism ~ and I say this knowing full well that our non-doctrinal, non-dogmatic church is not like the others. But nevertheless, we appear to "stand for" liberalism and tolerance, and even shades of "affluence," if Mr. Adkisson's resentment of liberals taking jobs away from him is any indication. And this scares me ~ which is evil in and of itself because fear breeds hate and hate breeds division and division breeds othering. I have absolutely no soteriological yearnings except insofar as I hope to have one last taste of buttered popcorn whilst sitting down for that last private flashback screening of This Was Your Life, Holy. And OK, I'll admit, I wouldn't so much mind if there was a free-fall bungee drop at the end of brightly-lit tunnel, where I could then practice a somersault or five dozen before leaping to either nirvanic extinction, or that next subway stop in the journey. But apart from those minor indulgences, I pray only that we earthlings might find a way to apply salvific cravings and heaven and hell motifs to the ones of our own making right here on earth. I'm nothing if not an idealist. I really do think the Real Thing is building the world a home, and furnishing it with love, and growing apple trees and honey trees and snow-white turtle doves. And let's not forget the part about teaching the world to sing in perfect harmony. The trick to 'New Eden' hunting is not in searching out greener grass but rather, in finding the common ground - the space between the dichotomies and polarities that divide us all. It's not in Birmingham, Alabama - where gun fire still rhymes acutely with children's choir. It ain't in Topeka, where nothing, even a funeral, is sacred anymore. It's nowhere near Eldorado, Texas and speaking of Zion, it sure ain't in Jerusalem, (if pilfering Obama's Wailing Wall note for profit is any indication). And sadly, it isn't in Knoxville, Tennessee either. But one fine day it might (nay it shall) be in all those places at once, wherein we dwell together in peace and unity. Peace starts from within as the little light, the beacon, we shine for others in namaskar omniscience, so that they might find their way to safe harbour from that lost, lonely and dark place. It is the light we illumine in honour of treating all people kindly, because they are our brothers and sisters, of taking good care of the earth, in all it's heaven and hell projections - and in trying to live lives filled with goodness and love, because that is how we will become the best men and women we can be. Yesterday, today and forever more, Greg McKendry and Linda Kraeger were and continue to be those candles, those beacons. May their Love and Light never die.